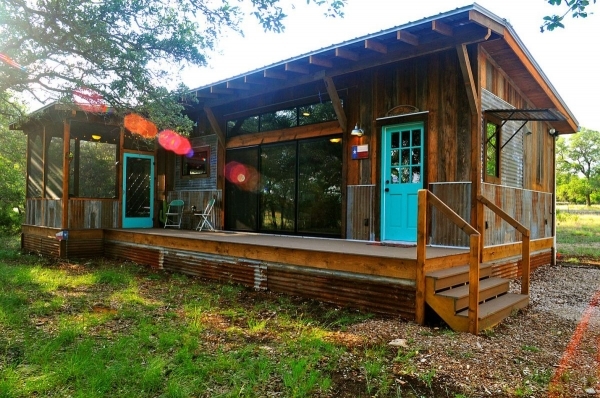 La Arboleda is a wood cabin with six hundred and forty square feet of living space, located in central Texas hill country. 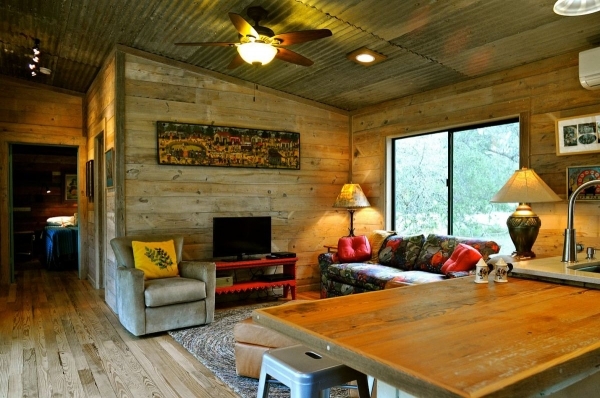 Created by Reclaimed Space, this beautiful house is made from different recycled materials, including barnwood and corrugated tin. It also uses environmentally friendly methods and systems, such as ductless air conditioning. 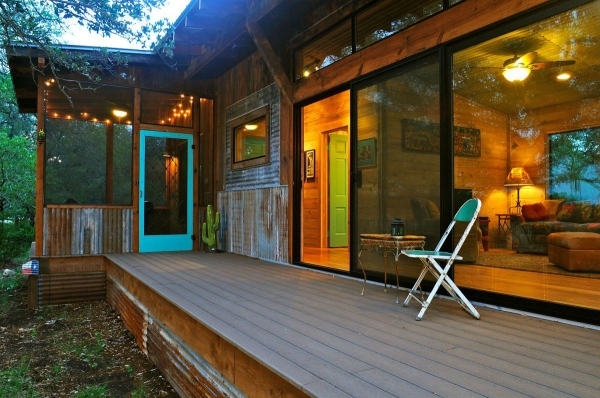 The exterior of this wood cabin is absolutely gorgeous with its stunning wood, corrugated tin, and turquoise doors. 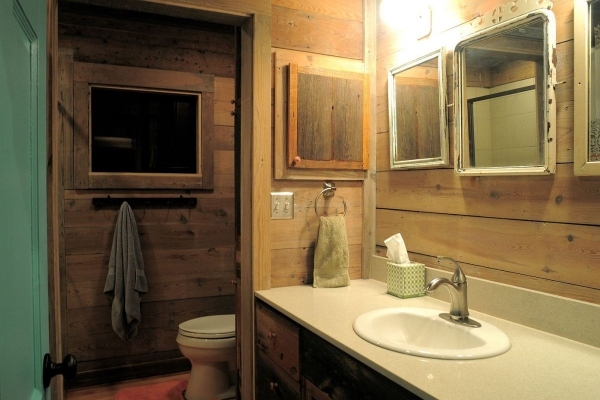 We love the way the colors of the wood and the doors interact with each other. 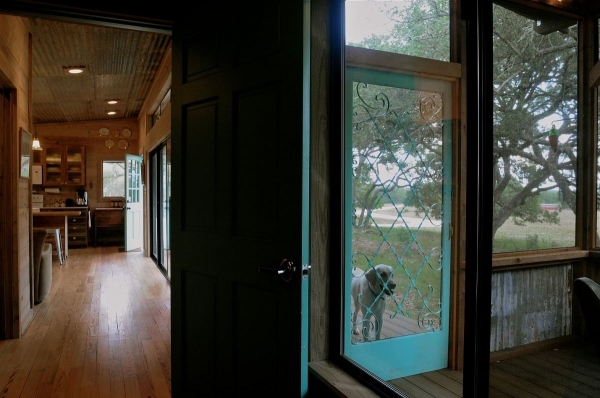 It has a rectangular shape, an uncovered porch, and a screened in porch. On the uncovered porch, a turquoise chair and a vintage table sit, complementing the outside design, and providing a space to relax. 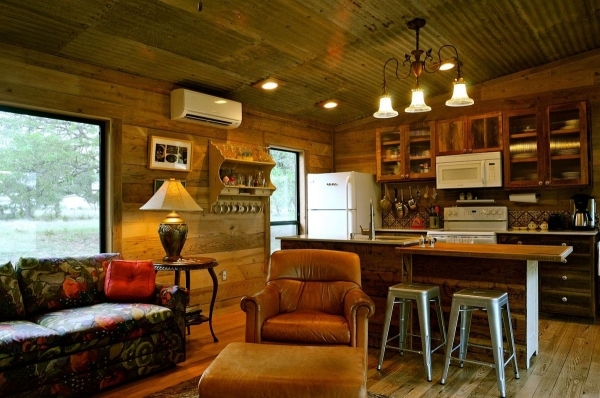 The inside of this cozy wood cabin boasts an open plan, large windows, and the continuation of the reclaimed wood and tin. 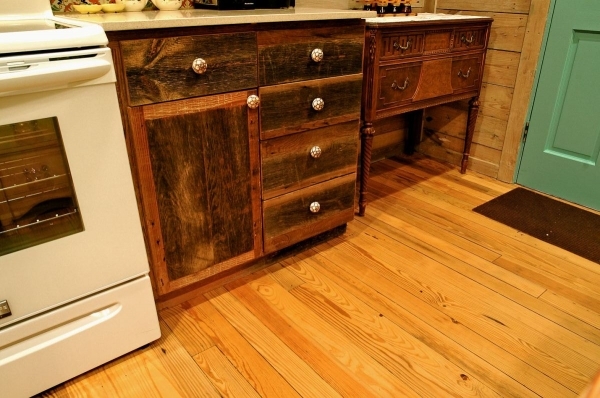 The kitchen has fabulous cabinets with detailed cabinet knobs, a sleek sink, and gorgeous silver stools. There are two different islands in this space. They create wonderful levels, adding variety and interest. The living room is positively delightful with its bold red accents, brown leather lounger, gray chair, and area rug. The artwork over the television is absolutely stunning, and it ties into the color scheme of the room. 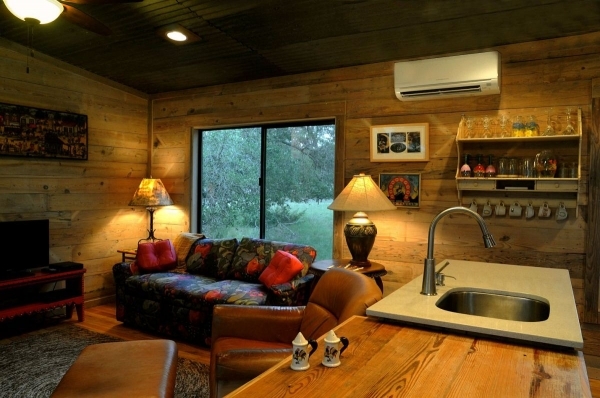 The colors used in this cozy space are an unexpected but wonderful touch. 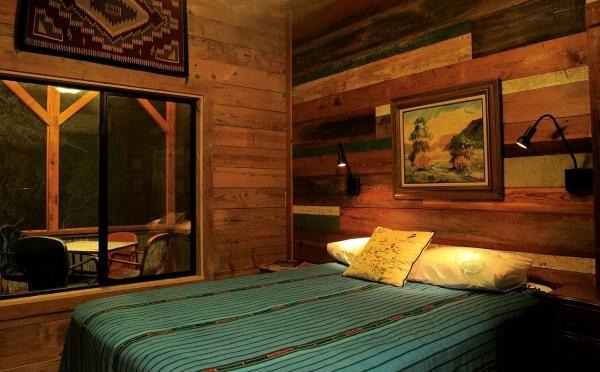 The bedroom in this wood cabin is simple and beautiful. The breathtaking wood is marvelously displayed behind the bed. The colors that run through it are absolutely amazing, and the teal comforter and the gorgeous art work, complement it beautifully. We love the black lighting on the wall, it’s just enough to highlight the design, and it doesn’t take anything away from the fantastic barnwood. 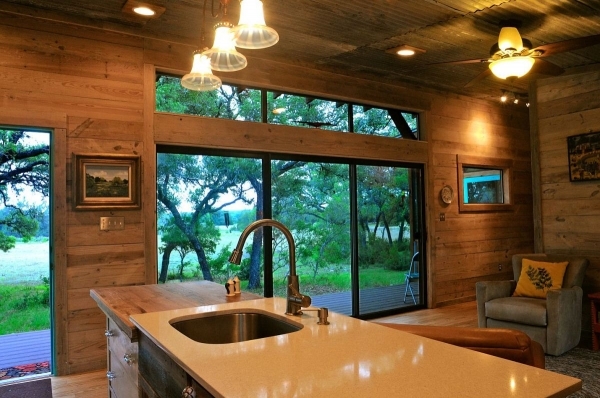 A window opens to the screened in porch, allowing natural light into the space. What I would give for this house!